WhatsApp playing an integral part of vital communication these days holds immense significance. Imagine, losing important photos that might be proof for something serious, like in a police case, proof of identity etc. The main concern is, when you don't have a copy of it anywhere else to get back the lost data. For such situations, you could always look for fail-proof methods to restore deleted photos from WhatsApp. If you have no idea as how to restore deleted photos from WhatsApp, then worry not! We are here to help you along. Well, let's see how to restore deleted photos from WhatsApp in various ways in this section of the article. Step 1: Connect your android device and enable the USB debugging by following the instructions. Step 2: Please choose the file type (WhatsApp messages & attachments) to restore after connecting your android device. Step 3: After the scanning finished, you can preview the found files before restore to device. If your iOS device's WhatsApp photos got deleted accidentally, then we recommend Tenorshare UltData for iOS for that matter. You can selectively preview and restore 20 plus file types including WhatsApp photos with this software. you can restore your data from iCloud/iTunes backup files as well. To explore the quick guide here. Step 1: At first, downloading the program and connecting your device. Step 2: You can check the WhatsApp & Attachments at the pannel, then tap "Start Scan". Step 3: After scanning, choose the file you wanted to preview. Step 4: Then click "Recover" to your computer or device. Update iTunes and launch it on your pre-trusted computer. Plug in your iPhone to the system and tap on its name in iTunes. Click 'Summary' > 'Restore Backup'. Select the most recent backup file from the list and tap 'Restore'. Your entire device backup will be restored rather than only WhatsApp. The existing data will be overwritten. For selectively restoring WhatsApp photos, we suggest you to go for Tenorshare iCareFone. It can selectively restore and backup WhatsApp and other data. You can even read the iTunes backup data with this tool. Moreover, it is a good tool to back up your WhatsApp messages to local computer. Step 1: Install and run Tenorshare iCareFone on your system. Plug in your iPhone and tap 'Backup & Restore'. Step 2: Assuming you already have an iTunes backup, tap 'To view or restore previous backup files' link from the bottom of the screen. iCareFone and iTunes backup files are found here. Pick your desired iTunes backup file and hit 'View'. Step 3: Tap 'WhatsApp Attachment' and 'App Photos' from the left side panel on next screen and hit 'Restore to Device'. Mention the destination folder on your system and click 'OK'. Tip: When restore deleted WhatsApp photos from iTunes backup, Tenorshare UltData for iOS can help you with its selective restoring functionality. Let's understand the quick guide to understand how it works. 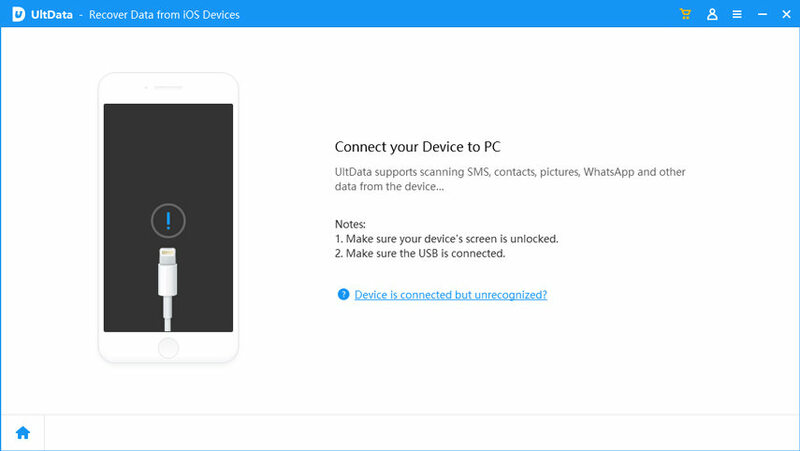 Step 1: Launch the tool and connect your device with PC. Click 'Recover from iTunes Backup File' tab. Step 2: Choose one iTunes backup file you need and hit 'Start Scan'. Step 3: To preview, click the scanned data i.e. WhatsApp attachments from the left panel. Hit on 'Recover' lastly. 1. On your iPhone, browse 'Settings' > 'General' > 'Reset' > 'Erase All Content & Settings' > 'Erase iPhone'. 2. Set up iPhone afresh. 3. On the 'Apps & Data' screen > 'Restore from iCloud Backup' > sign in to iCloud account > 'Choose backup' > pick the desired backup file'. You can't selectively restore WhatsApp photos. To restore WhatsApp photos must erase the iPhone first. All device data is lost. Alternatively, you can use Tenorshare UltData for iOS (WhatsApp Photo Recovery) to selectively restore deleted WhatsApp photos. 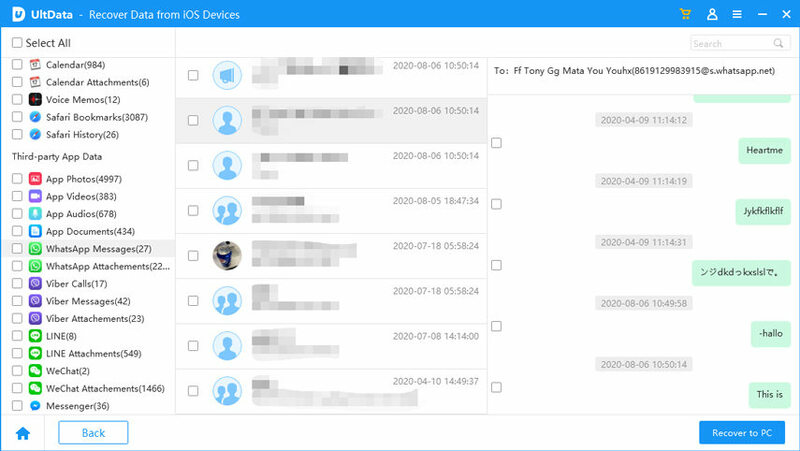 You can preview and restore selective or entire device data with it. You can recover data from the iPhone, iCloud or iTunes backup. Around 20 data types can be previewed and restored with UltData selectively from a jail broken, iOS crashed or factory reset iPhone. Step 1: Install and run Tenorshare UltData on your computer. Plug in your iPhone and press 'Recover from iCloud Backup file' tab. Enter your iCloud credentials afterwards. Step 2: Pick the desired iCloud backup file and click 'Next'. Step 3: Mark 'WhatsApp & Attachments' and hit 'Next'. The selected data photos will be displayed on screen. Step 4: Once, Tenorshare UltData automatically scans these downloaded WhatsApp photos, preview them after choosing 'WhatsApp Attachments' on the left-panel. After picking the desired photos press the 'Recover' button. From this article, we conclude that when it comes to selectively restore deleted WhatsApp or any other data, iCareFone and UltData are the best bets. You don't undergo any complication to retrieve the lost data. They are efficient, time saving and foolproof.